The Marine Atlantic Ferry system has a lifeboat attached to each ferry and this one belongs to the MV Caribou which travels between Newfoundland and Nova Scotia. Safety is an important factor when traveling on the Marine Atlantic Ferries and each ferry has a lifeboat nearby in the event of a emergency as you can see aboard the MV Caribou. This ferry system takes passengers and vehicles across the Strait of Belle Isle between Newfoundland and Nova Scotia, Canada. Life Boat on the M/V Caribou, the Marine Atlantic ferry which transports passengers and vehicles between Port aux Basques in Newfoundland and North Sydney, Nova Scotia, Canada. 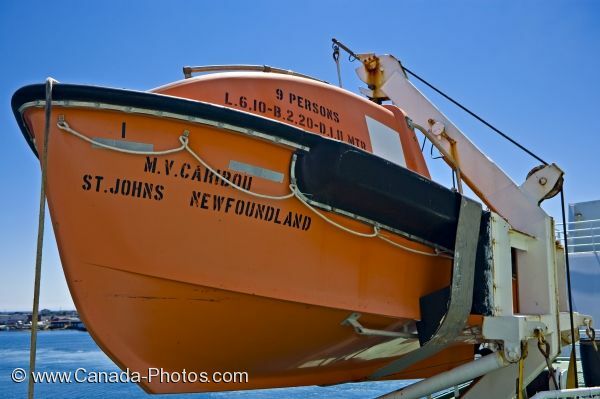 Picture of a lifeboat attached to the MV Caribou which is part of the fleet of the Marine Atlantic Ferry in Newfoundland.